A twin occupancy fully furnished ensuite room with single beds in a large 16 person suite. 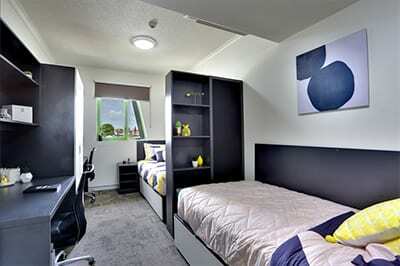 Room features unlimited wireless internet and air conditioning and the apartment features shared kitchen/lounge rooms. Prices are listed in $AUD and are subject to change dependent on availability and seasonal promotions. Prices are per person per week. Bond equal to 4 weeks rent and up to 2 weeks advance rent is required to secure your booking. 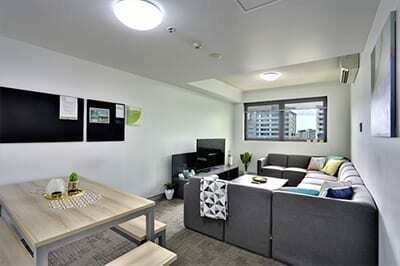 Am I able to choose my room mates? Unfortunately not, roommates are based on gender and age. If you have a friend also booking with urbanest you can opt to place each other as a preferred roommate. Do you offer cleaning services? No the bedrooms and apartments are not serviced by Urbanest. 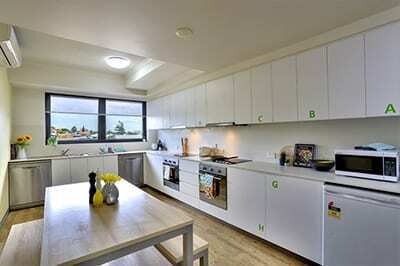 The cleanliness of all apartments is the responsibility of the residents themselves. Urbanest does provide cleaning kits which you can borrow from the friendly team at reception.